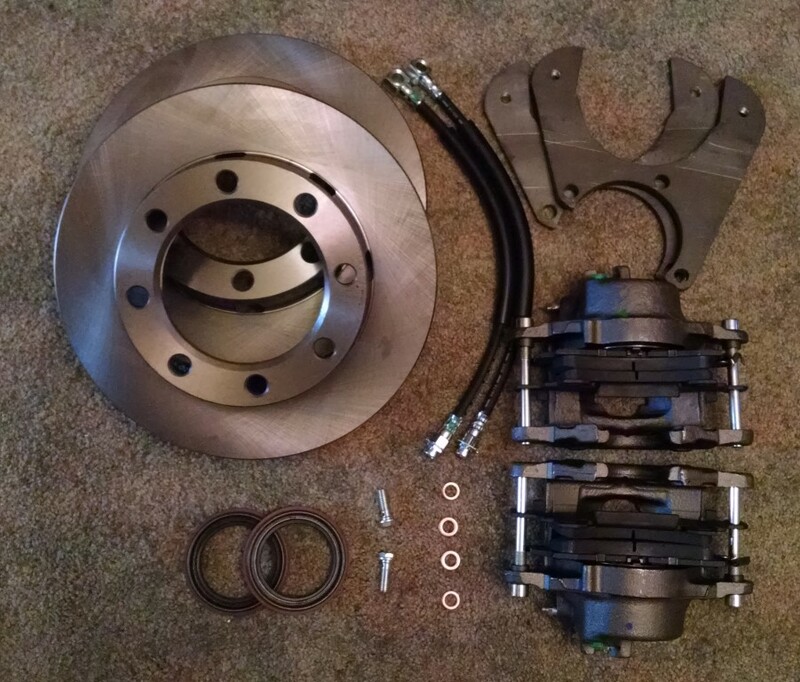 Upgrade the rear drum brakes on your Ford Sterling 10.25 axle with our disc brake conversion kit! Every US order includes free priority shipping. Whether you’re upgrading the drum brakes in your old pickup to disc, or adding disc brakes to an axle that’s going in a custom buggy, we’ve got you covered. 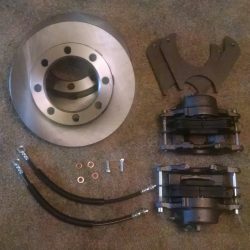 Every Lugnut4x4 disc brake conversion kit includes all the parts you need to convert your drum brakes to disc – all you need are the appropriate tools, brake fluid, and a little elbow grease. This drum brake conversion kit is for all Ford Sterling full float single rear wheel (SRW) axles with drum brakes. Some early years require the use of a washer as spacers for the bracket (included). This kit will clear most 16″ wheels. (2) GM standard duty JB6 3/4 ton truck brake calipers with steel pistons. Heavy-duty JB7 caliper upgrades are available. (1) set of four high quality semi-metallic brake pads. Ceramic brake pads are available as an upgrade. Please note that while mounting brackets are included in all our brake kits, our brackets are also sold individually here, and we can also provide longer braided stainless steel brake hoses here. To order this kit with the longer 18″ braided stainless, just order this kit with no hoses, and then add-on the 18″ hoses as a separate item. Kit includes instruction sheet and part number list, so that ordering replacement parts is easy. Anyone with a basic understanding of brake systems will find the installation simple. Our only bit of advice: The rotor goes on the backside of the hub. NOTE: Ford Sterling 10.25 disc brake conversion kit instructions can be viewed here. I have had these on my truck for over a year now. Installation was a breeze, anyone with mechanical knowledge should be able to do this in a couple hours. Only reason not 5 stars was after a cpl months, the backing on the pads came loose, slid down and rubbed on the rotor, making a serious noise. Should have popped for the upgraded pads! Otherwise, I couldn’t be happier! I will be changing out the pads for a higher grade set. On my application (1987 F350 4X4) I didn’t even have to use an adjustable prop valve or change anything! Brakes work fantastic! Thanks Lugnut 4X4!